T cells require both primary and costimulatory signals for optimal activation. The primary Ag-specific signal is delivered by engagement of the TCR. The second Ag-independent costimulatory signal is mediated by engagement of the T cell surface costimulatory molecule CD28 with its target cell ligand B7. However, many tumor cells do not express these costimulatory molecules. We previously constructed phage display derived FAB, G8, and Hyb3, Ab-based receptors with identical specificity but distinct affinities for HLA-A1/MAGE-A1, i.e., “TCR-like” specificity. These chimeric receptors comprised the FcεRI-γ signaling element. We analyzed whether linking the CD28 costimulation structure to it (γ + CD28) could affect the levels of MHC-restricted cytolysis and/or cytokine production. Human scFv-G8POS T lymphocytes comprising the γ + CD28 vs the γ signaling element alone produced substantially more IL-2, TNF-α, and IFN-γ in response to HLA-A1/MAGE-A1POS melanoma cells. Also a drastic increase in cytolytic capacity of scFv-G8POS T cells, equipped with γ + CD28 vs the γ-chain alone was observed. Tumor-associated Ags (1) or MHC class I-presented tumor rejection Ags (TRA)3 (2, 3) can be targeted by CTL-expressing (chimeric) single chain (sc) or two chain mAbs (4, 5, 6, 7, 8, 9, 10) or TCR (11, 12, 13, 14, 15, 16), respectively. Most immunotherapeutic strategies targeting TRA aim to induce and enhance the number of tumor-specific T lymphocytes in patients by peptide vaccination, because such cells can have the capacity to lyse (native) tumor cells (17, 18), and the transfer of such tumor-specific T lymphocytes to patients can have clinical significance (19, 20, 21, 22). However, the isolation of tumor-specific CTL and their expansion to significant numbers for clinical application on an individual basis is cumbersome and the outcome unpredictable. We and others developed strategies to permanently graft primary human T lymphocytes with MHC-restricted tumor specificity via retroviral introduction of, e.g., chimeric or nonmodified TCR αβ genes (11, 12, 13, 14, 15, 16) or mAb-based receptors (23, 24). Engineered primary human T lymphocytes expressing (chimeric) TCRs or two chain TCR-like mAbs display the Ag specificity dictated by the introduced TCR or TCR-like mAb; i.e., they specifically lyse relevant tumor cells and produce cytokines. To become independent of the availability of host-derived or in vitro stimulated tumor-specific CTL (clones) as a source of TCR αβ genes but still target TRA, we generated phage display-derived human mAbs with MHC-restricted TCR-like Ag specificities to genetically retarget human T cells to their tumors (23, 24). TCR as well as TCR-like Abs clearly differ from classical Abs not only with respect to their MHC restriction of Ag recognition but also with regard to ligand binding affinity, which is generally at least a log phase higher for classical mAb vs TCR-like Abs. We took advantage of the relative ease to adopt phage display libraries to allow for in vitro affinity maturation of these peptide/MHC-specific mAbs. Indeed, affinity maturation of the HLA-A1/MAGE-A1-specific Fab G8 resulted in a hyb3 variant, which displayed an 18-fold higher ligand binding affinity (24). Primary human T lymphocytes expressing this affinity-matured chimeric two chain Fab receptor showed enhanced in vitro immune functions, i.e., showed significantly higher levels of Ag-triggered production of TNF-α, IFN-γ, and IL-2, but also tumor cell lysis (24). Here we explored whether specific immune responses of T cells expressing chimeric single chain TCR-like (scFv) receptors could be further enhanced by linking the CD28 costimulatory domain to the γ-chain signaling element in both low and high affinity TCR-like scFvPOS T lymphocytes. To this end, we used scFv rather than two chain TCR-like receptor genes because this approach allows the introduction of scFv vs two chain TCR-like genes with higher efficiency. Primary human T lymphocytes with CD28 + γ signaling elements vs γ alone showed a significantly enhanced specific anti-tumor response, also at low TRA densities on tumor cells, and produce higher levels of the TNF-α, IFN-γ, and IL-2 cytokines. T lymphocytes derived from healthy donors were isolated and expanded as described (25). Target cell lines used in this study are: 1) the native MAGE-A1POS, HLA-A1POS melanoma cell line MZ2-MEL 3.0 (MEL3.0); 2) the MAGE-A1NEG, HLA-A1POS melanoma cell line MZ2-MEL 2.2 (MEL2.2) (kindly provided by T. Boon and P. Coulie, Ludwig Center Research Center, Brussels, Belgium) (26); 3) the HLA-A1POS B-LCL APD; and 4) the erythroid leukemia cell line K562. The human embryonic kidney cell line 293T (27) (kindly provided by Y. Soneoka, Department of Biochemistry, Oxford University, Oxford, U.K.,) and phoenix-amph (28) (kindly provided by G. Nolan, Department of Microbiology and Immunology, School of Medicine, Stanford University, Stanford, CA) were used as packaging cell lines for the pBullet scFv-γ and scFv-γ + CD28 retroviral vectors. Abs that were used in this study were anti-CD3 mAb OKT3 (Ortho Diagnostics) and anti-CD28 (CLB Amsterdam). Constructs containing chimeric receptors (Fig. 1⇓) were generated in two steps. First, the genes encoding the Fab G8 or Hyb3 H and L chain fragments (23, 24) were subjected to PCR to introduce restriction sites that allow gene insertion into the pBlue-212 vector (12). Second, the scFv G8 and scFv Hyb3 were introduced into the pBullet retroviral vector (12), either 5′ to a γ + CD28 fragment, which was derived from the scFv-SP6γ + CD28 construct (29), or 5′ to a fragment comprising the CD4 transmembrane domain and the intracellular domain of FcεRI-γ (23) resulting in the low affinity receptor vectors pBullet scFvG8-γ + CD28 and pBullet scFvG8-γ, and the high affinity receptor vectors pBullet scFvHyb3-γ + CD28, pBullet scFvHyb3-γ, respectively. Schematic presentation of the low and high affinity scFvG8-γ, Hyb3-γ and scFvG8-γ + CD28, Hyb3-γ + CD28 constructs. VH, variable heavy domain; l, linker; VL, variable L chain domain; CD4 Tm, CD4 transmembrane domain amino acids 395–419; CD28, CD28 amino acids 135–215; γ, FcεRI-γ amino acids 45–88. These low and high affinity scFv receptor genes were introduced into OKT3-activated primary human T lymphocytes by retronectin-enhanced supernatant transduction, essentially as described (23). Chimeric receptor-expressing T cells were then expanded in medium supplemented with rIL-2 (30). To assess the expression of low and high affinity scFv-γ + CD28 and scFv-γ receptors on gene-transduced primary human T lymphocytes, 0.5 × 106 cells were stained for 30 min at 4°C with saturating concentrations (11 nM final) of PE-labeled HLA-A1/MAGE-A1 tetramers, as described (12). The dot plots show viable T lymphoblast gated on forward (FSC) and sideward (SSC) light scatter signals. Analysis was performed on a FACScan instrument (BD Biosciences). To enrich for chimeric receptor-expressing T lymphocytes, transduced T lymphocytes were first incubated with PE-labeled HLA-A1/MAGE-A1 tetramers, followed by anti-PE-coated magnetic beads. Tetramer-binding T cells were subsequently obtained by magnetic separation using Miltenyi miniMacs columns (Miltenyi Biotec) according to the manufacturer’s instructions. Recombinant IL-2 (10 IU/ml) was present during the entire enrichment procedure. Cytolytic activities of enriched low and high affinity scFv-γ + CD28 or scFv-γ-transduced human T lymphocytes were measured in 51Cr release assays at indicated times, as described elsewhere (12). Peptide loading of target cells was performed by addition of MAGE-A1 nonapeptide (EADPTGHSY; Leiden University Medical Center, Leiden, The Netherlands) or an irrelevant influenza peptide derived from influenza virus A nucleoprotein (CTELKLSDY; Leiden University Medical Center) to target cells 5–15 min before incubation with effector T lymphocytes. The percentage of specific 51Cr release was calculated as follows: ((test counts − spontaneous counts)/(maximum counts − spontaneous counts)) × 100%. Experiments were performed in triplicate, and the SD did not exceed 10%. To quantify secreted TNF-α, IFN-γ, and IL-2, transduced and enriched human T lymphocytes (6 × 104) were cultured for 24 h either in the presence or absence of 2 × 104 adherent tumor cells. When TNF-α and IFN-γ production was assessed, culture medium was supplemented with 360 IU/ml rIL-2, whereas IL-2 production was assessed in medium without exogenous IL-2. Supernatants were harvested and levels of TNF-α, IFN-γ, and IL-2 were measured by standard ELISA according to the manufacturer’s instructions (CLB Amsterdam). Experiments were performed in triplicate, and the SD did not exceed 10%. The t test for means was used to analyze ELISA results. Genes encoding the chimeric receptors scFvG8-γ + CD28, scFvG8-γ, scFvHyb3-γ + CD28, and scFvHyb3-γ, specific for HLA-A1/MAGE-A1, were retrovirally introduced into OKT3-activated PBL (Fig. 1⇑). Cell surface expression of the chimeric low affinity scFvG8-γ + CD28 and scFvG8-γ on the one hand and high affinity scFvHyb3-γ + CD28 and scFvHyb3-γ TCR-like receptors on the other was demonstrated by PE-labeled HLA-A1/MAGE-A1 tetramer staining. Over 45% of enriched T cell transductants specifically bound the MAGE-A1/HLA-A1 tetramers (Fig. 2⇓A). Expression of the endogenous CD28 coreceptor on anti-CD3-activated gene-transduced T lymphocytes was lacking (Fig. 2⇓B), as reported for specific Ag-activated T lymphocytes (31). A, Low affinity scFvG8-γ, scFvG8-γ + CD28, and high affinity scFvHyb3-γ, scFvHyb3-γ + CD28 transduced primary human T lymphocytes specifically bind HLA-A1/MAGE-A1 tetramers. Cell surface expression of the scFv-γ and scFv-γ + CD28 receptors on transduced and tetramer-enriched T lymphocytes was analyzed via HLA-A1/MAGE-A1 tetramer staining (A1/M1; filled histogram). As a control for specific binding, HLA-A1/Flu tetramers were used, which contain a peptide derived from influenza nucleoprotein A (A1/Flu; open histogram). B, Absence of CD28 expression on OKT-3 mAb-activated T lymphocytes. Results are shown as histograms. Data acquisition was restricted to viable cells. TNF-α, IFN-γ, and IL-2 production by scFvG8-γ + CD28POS and scFvG8-γPOS T lymphocytes was measured following 24 h of incubation with stimulator cells: 1) native HLA-A1POS/MAGE-A1POS melanoma cell line MEL3.0; 2) MAGE-A1 peptide-loaded melanoma cell line MEL2.2; and 3) HLA-A1POS/MAGE-A1NEG MEL2.2 melanoma cells. The low affinity CD28 + γPOS T cell transductants showed increased and specific cytokine production in response to MAGE-A1POS melanoma cells in comparison with γPOS T lymphocytes. High affinity CD28 + γPOS T cell transductants also showed higher cytokine production levels in response to MAGE-A1POS melanoma cells, but this enhanced cytokine response was in part nonspecific because MAGE-A1NEG Ag lost mutant melanoma cells triggered IFN-γ and TNF-α production, but again production in response to MAGE-A1POS melanoma cells was still higher (Fig. 3⇓B). Control MAGE-A1NEG target cells that were loaded with an irrelevant peptide did not induce cytokine production by scFvG8-γ + CD28POS, scFvG8-γPOS and scFvHyb3-γPOS T lymphocytes (data not shown). Tumor-specific TNF-α, IFN-γ, and IL-2 production by enriched low affinity scFvG8-γ + CD28POS and scFvG8-γPOS T lymphocytes (A), and high affinity scFvHyb3-γ + CD28POS and scFvG8-γPOS T lymphocytes (B). Transduced T lymphocytes were cultured for 24 h in the presence of the following tumor cells: 1) M-1−, MEL2.2; 2) native M-1+, MEL3.0; and 3) M-1P, MEL2.2 + MAGE-A1 peptide (10 μg/ml final). After 24 h, levels of TNF-α, IFN-γ, and IL-2 present in the supernatant were measured by standard ELISA. Shown are mean percentages of specific cytokine release of triplicate measurements, with SDs not exceeding 10% of mean values. Results from one representative experiment of three are shown. p values (low affinity p < 0.001/high affinity p < 0.002) for a–f were obtained with Student’s t test. The cytotoxic responses of scFvG8-γ + CD28POS; scFvG8-γPOS; scFvHyb3-γ + CD28POS, and scFvHyb3-γPOS T lymphocytes were measured following a 4-h incubation with 51Cr-labeled target cells: 1) HLA-A1POS/MAGE-A1POS MEL3.0 melanoma cells; 2) MAGE-A1 peptide loaded MEL2.2 melanoma cells; 3) HLA-A1POS/MAGE-A1NEG MEL2.2 cells; 4) control HLA-A1POS B-LCL APD; and 5) control K562 myeloid leukemia cells. Significant higher levels of specific cytolysis were obtained when HLA-A1POS/MAGE-A1POS melanoma cells and MAGE-A1-peptidePOS melanoma target cells were incubated with low affinity scFvG8-γ + CD28POS T lymphocytes when compared with scFvG8-γPOS T lymphocytes (Fig. 4⇓A). ScFv receptors comprising γ + CD28 mediate a more potent cytolytic T cell response. 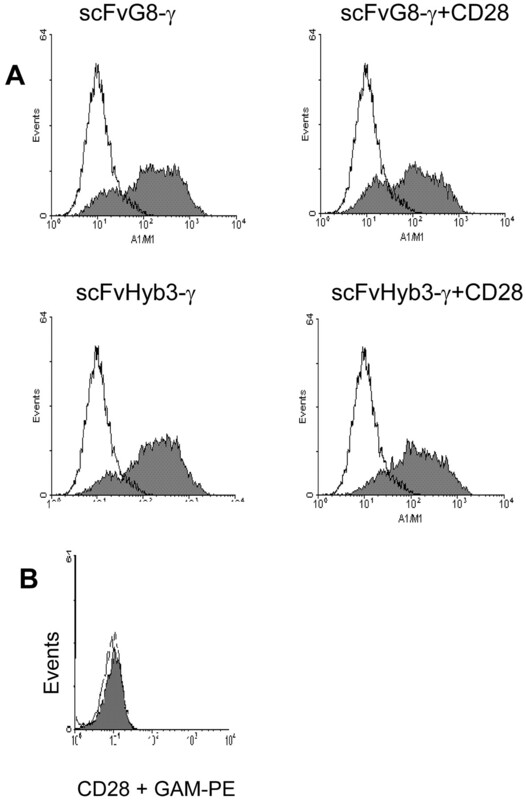 Low affinity ScFvG8-γ + CD28POS and scFvG8-γPOS primary human T lymphocytes (A) and high affinity ScFvHyb3-γ + CD28POS and scFvHyb3-γPOS primary human T lymphocytes (B) were incubated for 4 h, at indicated effector to target cell ratios, with the following 51Cr-labeled melanoma target cells: 1) A1+/M1− MEL2.2; 2) MEL2.2 + MAGE-A1 peptide (10 μM final); 3) A1+/M1+ MEL3.0; 4) A1−/M1− K562; and 5) A1+/M1− APD. ScFvG8-γ + CD28POS and scFv Hyb3-γPOS T lymphocytes (C) mediate cytolysis with a higher sensitivity to Ag density. 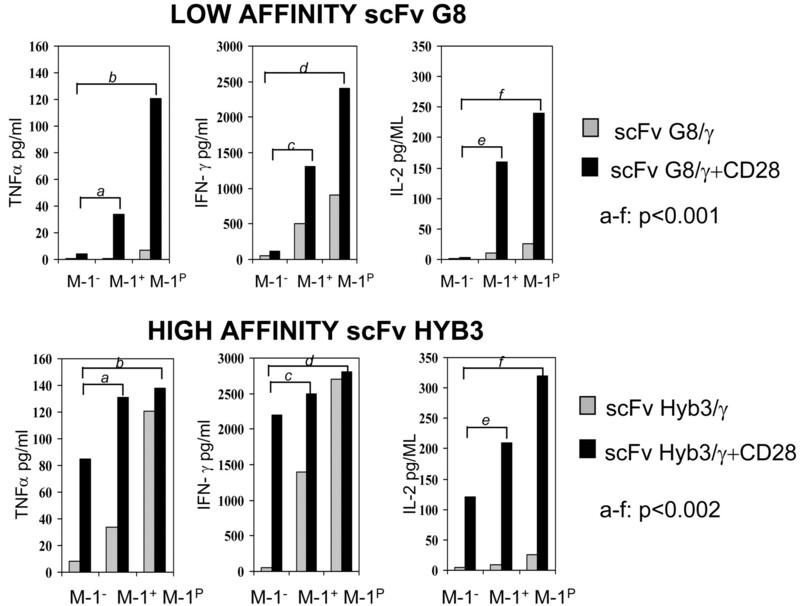 ScFvG8-γ + CD28POS, scFvG8-γPOS, scFvHyb3-γPOS and scFvHyb3-γ + CD28POS primary human T lymphocytes were incubated for 4 h, at indicated effector to target cell ratios, with 51Cr-labeled MEL2.2 cells loaded with increasing concentrations of MAGE-A1 peptide (M1, ranging from 0.01 to 10 μM final concentration). Shown are mean percentages of specific 51Cr release of triplicate measurements, with SDs not exceeding 10% of mean values. Data from one representative experiment (of three) are shown. Remarkably, significant higher levels of specific target cell lysis by high affinity scFvHyb3-γ + CD28POS T lymphocytes were observed, not only of relevant HLA-A1POS/MAGE-A1POS melanoma cells, but also of irrelevant K562 and APD target cells, as well as MAGE-A1NEG Ag lost mutant melanoma cells (Fig. 4⇑B). When MAGE-A1NEG Ag lost mutant MZ2-MEL2.2 melanoma target cells were loaded with increasing concentrations of MAGE-A1 peptide (ranging from 1 nM to 10 μM) and used as specific target cells, the low affinity scFvG8-γ + CD28POS vs scFvG8-γPOS T lymphocytes showed a significant increased specific lytic capacity. ScFvG8-CD28 + γPOS vs scFvG8-γPOS T lymphocytes required 10-fold less MAGE-A1 Ag at the target cell than scFvG8-γPOS T lymphocytes for triggering of equal levels of Ag-specific cytolytic activity (Fig. 4⇑C). High affinity CD28 + γPOS T cells also demonstrated enhanced cytolytic activity when compared with the Hyb3-γPOS T cells, but this enhanced cytolytic activity was only partial specific as non-MAGE-A1 peptide loaded target cells were also lysed (Fig. 4⇑C). We have in vitro generated class I-HLA-A1/MAGE-A1-specific human CTLs by genetically programming primary human T lymphocytes with low affinity G8 and high affinity Hyb3 receptors comprising the γ-chain signaling element (23, 24). These phage display-derived G8 and Hyb3 receptors display a TCR-like specificity, i.e., they recognize MAGE-A1 in the context of class I-HLA-A1. Here we describe the immune response enhancing effects of genetically linking the CD28 costimulation structure to the γ-chain in low and high affinity receptors (G8 and Hyb3 mAbs, respectively). This was done because first, human tumor cells reportedly lack the B7 ligand for CD28 (32); second, we discovered that virtually all human T lymphocytes lack functional expression of the critical costimulatory CD28 molecule following T lymphocyte activation in vitro by anti-CD3 mAb (OKT3), which is required for subsequent gene transduction; third, classic scFv mAb-based receptorPOS T lymphocytes, i.e., with MHC nonrestricted Ag recognition, comprising γ or ζ + CD28 signaling structures show significant enhanced cytokine production but no enhanced cytolytic capacity (33, 34, 35, 36, 37, 38, 39, 40, 41, 42, 43, 44). The immune responses of phage display-derived Ab receptorPOS CTLs with TCR-like specificity comprising the combined γ + CD28 signaling elements were significantly enhanced, not only at the level of cytokine production triggered by TRAPOS stimulator cells, but surprisingly also at the level of TRA-specific target cell lysis. In contrast, human T lymphocyte transductants expressing classic scFv mAb-based receptors comprising ζ + CD28 or ζ only showed increased cytokine production capacity but no increased lytic capacity (37, 42, 44). The immune responses of these low and high affinity receptorPOS T cell transductants with the γ + CD28 signaling element, which lack functional expression of CD28 themselves, are efficiently reconstituted by incorporation of the CD28 costimulatory element into the scFv-γ receptor. Because the CD28 costimulatory element is now built into the scFv-γ receptor the frequent lack of the B7 ligand expression on tumor cells is bypassed. T lymphocytes expressing low affinity scFvG8 comprising the combined γ + CD28 signaling element display significant enhanced production of TNF-α, IFN-γ, and IL-2 in response to relevant MAGE-A1POS stimulator cells. The enhanced cytokine production levels may also have relevant consequences in adoptive immunogene therapy because it has been reported that classic MHC nonrestricted scFv Ab-based receptorPOS T cell transductants comprising γ + CD28 or ζ + CD28 provided animals with increased reduction of tumor mass that appeared IFN-γ dependent (35, 36, 38). The tumor-specific induction of, e.g., IL-2 production by scFvG8-γ + CD28POS T lymphocytes may bypass the need for exogenous IL-2 in clinical trials to obtain enhanced anti-tumor activity as well as prolonged life span (21, 22, 45). Reportedly, the life span of human CMV-reactive CTL and adoptively transferred MART1/MelanA or gp100-specific T cell clones was indeed prolonged by the administration of exogenous IL-2 (21, 45). The level of immune responses of low affinity scFvG8-γ + CD28POS T lymphocytes was comparable to that of high affinity scFv Hyb3-γ alone receptorPOS T lymphocytes and was HLA-A1/MAGE-A1 specific. However, when the high affinity receptor was engineered to comprise the combined γ + CD28, we discovered that they also were triggered by, i.e., nonspecific MAGE-A1NEG cells, to produce cytokines and lyse the target cells. For example, these high affinity scFvHyb3-γ + CD28POS T lymphocyte also lysed MAGE-A1NEG melanoma cells, APD B-LCL, and K562 myeloid leukemia cells, albeit at lower levels (Fig. 4⇑B). Like TCRs, TCR-like Abs may display affinities for class I molecules presenting irrelevant peptides (25, 46). However, the rate of dissociation of nonspecific TCR/MHC complexes is sufficiently high that dissociation always occurs before the nonspecific interaction can activate the TCR-expressing lymphocytes. The difference in dissociation constant between Hyb3 and nonspecific HLA-A1 complexes vs Hyb3 and HLA-A1 molecules presenting MAGE-A1 may be reduced when compared with the dissociation constants of the G8 Ab/HLA-A1 complexes. The consequently prolonged interaction of the Hyb3 receptor with the nonspecific HLA-A1 in combination with the higher triggerable γ + CD28 signaling structure results in the “nonspecific” cytolysis and cytokine production. The affinity maturation of the TCR-like Ab scFvG8 allows the generation of a library of CTL clones with a range of affinities from low to high, based on the use of differential VHVL genes and hence mimics the natural polymorphic T lymphocyte response. The enhancement of the overall immune responses by either affinity maturation of the receptor, linkage of distinct signaling elements together, or combinations thereof will produce T lymphocyte transductants that display distinct TRA triggerabilities: e.g., cytokine production levels and profiles; target cell lytic capacities; and tumor mass penetration abilities. However, as shown here maximum triggerability may result in loss of specificity of the immune response and hence unwanted kill of innocent bystander cells, thereby triggering autoimmune reactions. Therefore, it is mandatory to test these T cell transductants for exquisite Ag specificity before use in clinical therapy protocols. ↵1 This work was supported by European Union Biotech Grant QLK3-1999-01262. ↵3 Abbreviation used in this paper: TRA, tumor rejection Ag. McKenzie, I. F., V. Apostolopoulos, M. Plebanski, G. A. Pietersz, B. E. Loveland. 2003. Aspects of cancer immunotherapy. Immunol. Cell Biol. 1: 79-85. Renkvist, N., C. Castelli, P. F. Robbins, G. Parmiani. 2001. A listing of human tumor antigens recognized by T cells. Cancer Immunol. Immunother. 50: 3-15. Rosenberg, S. A.. 1997. Cancer vaccines based on the identification of genes encoding cancer regression antigens. Immunol. Today 18: 175-184. Kuwana, Y., Y. Asakura, N. Utsunomiya, M. Nakanishi, Y. Arata, S. Itoh, F. Nagase, Y. Kurosawa. 1987. Expression of chimeric receptor composed of immunoglobulin-derived V regions and T-cell receptor-derived C regions. Biochem. Biophys. Res. Commun. 149: 960-968. Gross, G., Z. Eshhar. 1992. Endowing T cells with antibody specificity using chimeric T cell receptors. FASEB J. 6: 3370-3378. Eshhar, Z., T. Waks, G. Gross, D. G. Schindler. 1993. Specific activation and targeting of cytotoxic lymphocytes through chimeric single chains consisting of antibody binding domains and the γ or ζ subunits of the immunoglobulin and T cell receptors. Proc. Natl. Acad. Sci. USA 90: 720-724. Nolan, K. F., C. O. Yun, Y. Akamatsu, J. C. Murphy, S. O. Leung, E. J. Beecham, R. P. Junghans. 1999. Bypassing immunization: optimized design of “designer T cells” against carcinoembryonic antigen (CEA)-expressing tumors, and lack of suppression by soluble CEA. Clin. Cancer Res. 5: 3928-3941. Moritz, D., W. Wels, J. Mattern, B. Groner. 1994. Cytotoxic T lymphocytes with grafted recognition specificity for ERBB2-expressing tumor cells. Proc. Natl. Acad. Sci. USA 91: 4318-4322. Hombach, A., C. Heuser, R. Sircar, T. Tillmann, V. Diehl, C. Pohl, H. Abken. 1998. An anti-CD30 chimeric receptor that mediates CD3-ζ-independent T-cell activation against Hodgkin’s lymphoma cells in the presence of soluble CD30. Cancer Res. 58: 1116-1119. Weijtens, M. E. M., R. A. Willemsen, D. Valerio, K. Stam, R. L. H. Bolhuis. 1996. Single chain Ig/γ gene-redirected human T lymphocytes produce cytokines, specifically lyse tumor cells, and recycle lytic capacity. J. Immunol. 157: 836-843. Heemskerk, M. H., R. A. de Paus, E. G. Lurvink, F. Koning, A. Mulder, R. Willemze, J. J. van Rood, J. H. Falkenburg. 2001. Dual HLA class I and class II restricted recognition of alloreactive T lymphocytes mediated by a single T cell receptor complex. Proc. Natl. Acad. Sci. USA 98: 6806-6811. Stanislawski, T., R. H. Voss, C. Lotz, E. Sadovnikova, R. A. Willemsen, J. Kuball, T. Ruppert, R. L. Bolhuis, C. J. Melief, C. Huber, et al 2001. Circumventing tolerance to a human MDM2-derived tumor antigen by TCR gene transfer. Nat. Immunol. 2: 962-970. Schaft, N., R. Willemsen, J. de Vries, B. Lankiewicz, B. Esser, J.-W. Gratama, C. Figdor, R. Bolhuis, R. Debets, G. Adama. 2003. Peptide fine-specificity of anti-gp100 CTL is preserved following transfer of engineered TCRα/β genes into primary human T lymphocytes. J. Immunol. 170: 2186-2194. Machiels, J. P., N. van Baren, M. Marchand. 2002. Peptide-based cancer vaccines. Semin. Oncol. 29: 494-502. Parmiani, G., C. Castelli, P. Dalerba, R. Mortarini, L. Rivoltini, F. M. Marincola, A. Anichini. 2002. Cancer immunotherapy with peptide-based vaccines: what have we achieved? Where are we going?. J. Natl. Cancer Inst. 94: 805-818. Rosenberg, S. A., B. S. Packard, P. M Aebersold, D. Solomon, S. L. Topalian, S. T. Toy, P. Simon, M. T. Lotze, J. C. Yang, C. A. Seipp, et al 1988. Use of tumor-infiltrating lymphocytes and interleukin-2 in the immunotherapy of patients with metastatic melanoma: a preliminary report. N. Engl. J. Med. 319: 1676-1680. Rosenberg, S. A., J. R. Yannelli, J. C. Yang, S. L. Topalian, D. J. Schwartzentruber, J. S. Weber, D. R. Parkinson, C. A. Seipp, J. H. Einhorn, D. E. White. 1994. Treatment of patients with metastatic melanoma with autologous tumor-infiltrating lymphocytes and interleukin-2. J. Cancer Inst. 86: 1159-1166. Dudley, M. E., J. R. Wunderlich, P. F. Robbins, J. C. Yang, P. Hwu, D. J. Schwartzentruber, S. L. Topalian, R. Sherry, N. P. Restifo, et al 2002. Cancer regression and autoimmunity in patients after clonal repopulation with antitumor lymphocytes. Science 298: 850-854. Willemsen, R. A., R. Debets, E. H. Hart, H. R. Hoogenboom, R. L. H. Bolhuis, P. Chames. 2001. A phage display selected fab fragment with MHC class I-restricted specificity for MAGE-A1 allows for retargeting of primary human T lymphocytes. Gene Ther. 8: 1601-1608. Van de Griend, R. J., B. A. Van Krimpen, S. J. L. Bol, A. Thompson, R. L. H. Bolhuis. 1984. Rapid expansion of human cytotoxic T cell clones: growth promotion by a heat-labile serum component and by various types of feeder cells. J. Immunol. Methods 66: 285-298. Soneoka, Y., P. M. Cannon, E. E. Ramsdale, J. C. Griffiths, G. Romano, S. M. Kingsman, A. J. Kingsman. 1995. A transient three-plasmid expression system for the production of high titer retroviral vectors. Nucleic Acids Res. 23: 628-633. Grignani, F., T. Kinsella, A. Mencarelli, M. Valtieri, D. Riganelli, F. Grignani, L. Lanfrancone, C. Peschle, G. P. Nolan, P. G. Pelicci. 1998. High-efficiency gene transfer and selection of human hematopoietic progenitor cells with a hybrid EBV/retroviral vector expressing the green fluorescence protein. Cancer Res. 58: 14-19. Weijtens, M. E. M., R. A. Willemsen, E. H. Hart, R. L. H. Bolhuis. 1998. A retroviral vector system ‘STITCH’ in combination with an optimized single chain antibody chimeric receptor gene structure allows efficient gene transduction and expression in human T lymphocytes. Gene Ther. 5: 1195-1203. Haynes, N. M., J. A. Trapani, M. W. Teng, J. T. Jackson, L. Cerruti, S. M. Jane, M. H. Kershaw, M. J. Smyth, P. K. Darcy. 2002. Rejection of syngeneic colon carcinoma by CTLs expressing single-chain antibody receptors codelivering CD28 costimulation. J. Immunol. 169: 5780-5786.
van der Bruggen, P., C. Traversari, P. Chomez, C. Lurquin, E. De Plaen, B. Van den Eynde, A. Knuth, T. Boon. 1991. A gene encoding an antigen recognized by cytolytic T lymphocytes on a human melanoma. Science 254: 1643-1647. Schultze, J., L. M. Nadler, J. G. Gribben. 1996. B7-mediated costimulation and the immune response. Blood Rev. 10: 111-127. Maher, J., R. J. Brentjens, G. Gunset, I. Riviere, M. Sadelain. 2002. Human T-lymphocyte cytotoxicity and proliferation directed by a single chimeric TCRζ/CD28 receptor. Nat. Biotechnol. 20: 70-75. Geiger, T. L., P. Nguyen, D. Leitenberg, R. A. Flavell. 2001. Integrated src kinase and costimulatory activity enhances signal transduction through single-chain chimeric receptors in T lymphocytes. Blood 98: 2364-2371. Eshhar, Z., T. Waks, A. Bendavid, D. G. Schindler. 2001. Functional expression of chimeric receptor genes in human T cells. J. Immunol. Methods 248: 67-76. Haynes, N. M., J. A. Trapani, M. W. Teng, J. T. Jackson, L. Cerruti, S. M. Jane, M. H. Kershaw, M. J. Smyth, P. K. Darcy. 2002. Single-chain antigen recognition receptors that costimulate potent rejection of established experimental tumors. Blood 100: 3155-3163. Beecham, E. J., Q. Ma, R. Ripley, R. P. Junghans. 2000. Coupling CD28 co-stimulation to immunoglobulin T-cell receptor molecules: the dynamics of T-cell proliferation and death. J. Immunother. 23: 631-642. Pinthus, J. H., T. Waks, K. Kaufman-Francis, D. G. Schindler, A. Harmelin, H. Kanety, J. Ramon, Z. Eshhar. 2003. Immuno-gene therapy of established prostate tumors using chimeric receptor-redirected human lymphocytes. Cancer Res. 63: 2470-2476. Finney, H. M., A. D. Lawson, C. R. Bebbington, A. N. Weir. 1998. Chimeric receptors providing both primary and costimulatory signaling in T cells from a single gene product. J. Immunol. 161: 2791-2797. Krause, A., H. F. Guo, J. B. Latouche, C. Tan, N. K. Cheung, M. Sadelain. 1998. Antigen-dependent CD28 signaling selectively enhances survival and proliferation in genetically modified activated human primary T lymphocytes. J. Exp. Med. 188: 619-626. Alvarez-Vallina, L., R. A. Hawkins. 1996. Antigen-specific targeting of CD28-mediated T cell co-stimulation using chimeric single-chain antibody variable fragment-CD28 receptors. Eur. J. Immunol. 26: 2304-2309. Hombach, A., D. Sent, C. Schneider, C. Heuser, D. Koch, C. Pohl, B. Seliger, H. Abken. 2001. T-cell activation by recombinant receptors: CD28 costimulation is required for interleukin 2 secretion and receptor-mediated T-cell proliferation but does not affect receptor-mediated target cell lysis. Cancer Res. 61: 1976-1982. Hombach, A., A. Wieczarkowiecz, T. Marquardt, C. Heuser, L. Usai, C. Pohl, B. Seliger, H. Abken. 2001. Tumor-specific T cell activation by recombinant immunoreceptors: CD3 ζ signaling and CD28 costimulation are simultaneously required for efficient IL-2 secretion and can be integrated into one combined CD28/CD3 ζ signaling receptor molecule. [Published erratum appears in 2004 J. Immunol. 173: 695]. J. Immunol. 167: 6123-6131. Abken, H., A. Hombach, C. Heuser, K. Kronfeld, B. Seliger. 2002. Tuning tumor-specific T-cell activation: a matter of costimulation?. Trends Immunol. 23: 240-245. Riddell, S. R., P. D. Greenberg. 2000. T-cell therapy of cytomegalovirus and human immunodeficiency virus infection. J. Antimicrob. Chemother. 45: 35-43. McKeithan, T. W.. 1995. Kinetic proofreading in T-cell receptor signal transduction. Proc. Natl. Acad. Sci. USA 92: 5042-5046. Chames, P., S. E. Hufton, P. G. Coulie, B. Uchanska-Ziegler, H. R. Hoogenboom. 2000. Direct selection of a human antibody fragment directed against the tumor T-cell epitope HLA-A1-MAGE-A1 from a nonimmunized phage-Fab library. Proc. Natl. Acad. Sci. USA 97: 7969-7974.